Meet Dolores, she's a Virgo. The “Sea Monster” on her body is designed by Andrew Rae. 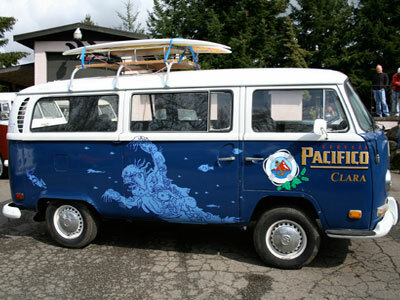 The Monster is nothing harmful and favors fish taco with Pacifico. She currently enjoys her life in Las Vegas, Nevada delivering cold Pacificos. I would like to know who won the Dolores Bus in Las Vegas. Our Pacifico buses haven't been auctioned off, they still work the streets for our local distributors who show them off at events and parties around town. Dolores is still making the rounds in Vegas so keep an eye out for her. If the day comes that we do look to find new homes for our buses, you'll certainly be able to find out on this blog. So keep checking back. Lee's Liquor Store here in Las Vegas had a drawing to win the Dolores Bus. It doesn't sound like the drawing took place??? This and other sites talk about the 19 hand painted buses, but if you look at the site above I count 20 buses. Was Dolores Bus given away at the Lee's Liquor Drawing or not???????? a 20th bus was added later last summer. And yes, Dolores found a home with a lucky VW lover in Vegas during the city-wide promotion.